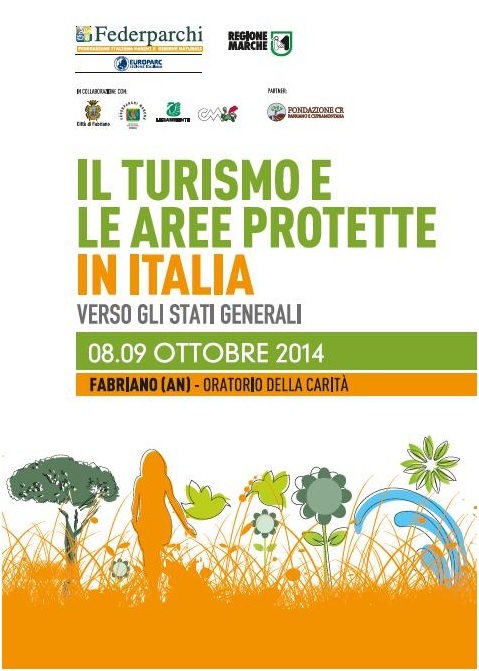 The Natural Regional Park of Gola della Rossa and Frasassi is the " green heart " of Marche Region. It was born in September 1997 (L.R. n.57 of 02.09.1997), with its 10.026 hectares, it is the largest regional protected area and includes the subterranean complex of Frasassi caves. A trip in the park is a "trip in the Marche heart", discovering the historical and artistic treasures, hidden by landscapes rich in charm and harmony, immersed in an uncontaminated nature and luxuriant. 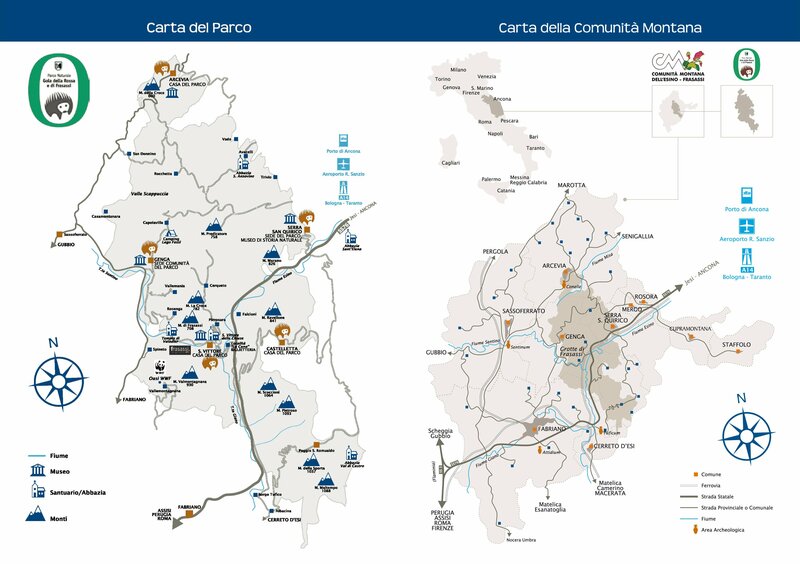 the natural scenarios just described are inserted in a wider area, that of Montana Community of Esino-Frasassi , from many historical treasures, archaelogical and cultural sites. The park is an oasis of nature that offers the possibility to make excursions to its many paths, admiring the flora and fauna's rich typical of the pre-Apennines. Interesting natural phenomena involving this area: the karst and the presence of sulfur springs. Wonderful Karst example is the suggestive Gola of Frasassi , excavated by water erosion of the river that for millenia has shape these lands, creating rocky cliffs and giving rise to an underground kingdom of unrivaled splendor: the caves of Frasassi. Apart the wonders of karst phenomena, the area si a jewel of biodiversity with its 105 species of nesting birds, 40 species of mammals, reptiles and amphibians and 29 among more than 1250 plant species. The fauna who lives in the Park of Gola Della Rossa and Frasassi highlights species of considerable conservation value for Marche. Among the birds are counted 105 breeding species of the 124 present in the Province of Ancona. The Royal Eagle si the top of the food chain consist of mammals, birds, amphibians and crustaceans in the Park, specifically in the Gola of Frasassi, the only nesting pair of the province of Ancona. Also important was the presence of other diurnal raptors such as the Hawk , the Harrier , the Red Kite , the Lanner and Peregrin Falcon . The clubs Raptors are represented by the Owl , The Barn Owl , from the eared Owl and Tawny Owl , was also recentl confirmed the presence of the Royal Owl in an area of park. Among mammals, stand the presence of wolf, which has re-colonized the Marche ridge in the last decade thanks to legal protection of species and population expansion of prey species such as wild boar , buck and roe and recently the deer . There are also wild cat and the skunk in addition to the more common fox , wasel, marten and badger . Among the rodents, in addition to the most common squirrel and porcupine , the Park includes rare and elusive species like the rat dormouse . Among the insectivorous mammals, there are the Hedgehog , animal symbol of the park, the blind mole and shrews . The Numerous hypogean cavities present in this area are populated by more than ten differente species of bats. Colonies of Bats of the park are among the most important in Europe, with more than 12.000 Miniotteri , present both in the wintering sites in reproducitve nursey . Among subterranean fauna, in addition to Geotritone is remarkable the presence of Niphargus , a rare and tiny crustaceans that populate the lakes of the caves. Regarding the flora in areas limestone hills of the plan are common hornbeamforests, over those marly-arenaceous oak forests sometimes with Cerro . In the montane floor grow beech forests . Warmer on the slopes of rocky gorges, the vegetationi is typically Mediterranean with holm oak, wild madder, terebinth, phillyrea, arbutus, asparagus and stracciabraghe . Vast areas of the Apennines have been affected by afforestation measures undertaken since the end of last century. The plants have been conducted mostly with conifers including: the black pine of Austria, the pinon pine (P. pinea), the pine, the Leppo pine, silver fir, greek fir, the cedars and cypresses. In the territory of the park, it found extensive grassland formations, especially in areas of the relief summit. In the Park grow many rare botanical species, among these features is the Moehringia papulosa that all over the world are found only in the Gole Of Frasassi, of Rossa and of Furlo, the Potentilla caulescens, the Rhamnus saxatilis, Saxifraga australis and the Ephedra major , relict of the Tertiary Era . Under the art-historical aspect, the territory of the park is filled with a dense network of castles and monasteries of which there are many vestiges. Among hte most important include: the large old town centers of Arcevia and Serra San Quirico, the Shrine of Frasassi, abbeys of St.Elena, St. Victor of Chiuse and Valdicastro, the castles of Genga, Pierosara, Avacelli and Castelletta.